Leptospirosis infections, caused by Leptospira bacteria, occur in people and animals around the world, but different strains of the bacteria may vary in their ability to cause disease and to jump between species. 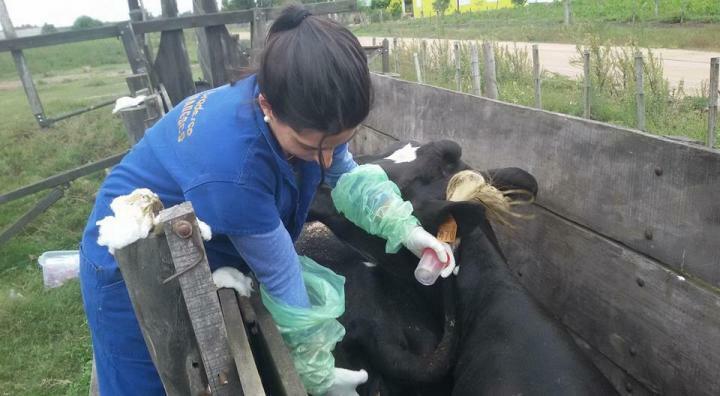 Now, researchers reporting in PLOS Neglected Tropical Diseases have for the first time described the characteristics of the Leptospira variants that infect cattle in Uruguay. Leptospirosis is most often transmitted to humans through contaminated water, and outbreaks are seen in tropical and subtropical areas after large amounts of rain or floods. Water can initially be contaminated through the urine of infected animals, including rats, cattle, horses, sheep, pigs and dogs. In Uruguay, beef and dairy exports are leading sources of national income. To determine the identity of the Leptospira variants that infect cattle in Uruguay, and whether they are a potential risk for humans, a multicentric consortium was created involving the Institut Pasteur of Montevideo, the Faculty of Medicine (Udelar), the Agricultural Research National Institute (INIA) and the Ministry of Livestock (MGAP). This multidisciplinary team sampled urine and blood from 963 cattle at 48 beef and dairy farms around Uruguay. Additionally, they collected the urine and kidneys from 577 animals from 22 slaughterhouses. Each sample was tested for the presence of Leptospira and, if present, for the exact strain. The researchers found that 20% of all cattle sampled were shedding pathogenic Leptospira in their urine, representing a large public health risk. 40 different strains of the bacteria were isolated, uncovering an unexpectedly large variation. The bacteria identified included three rare isolates undetected by normal tests, and two serotypes of the bacteria that matched exactly with those previously isolated from leptospirosis patients.